Home » WIN » Win a copy of ‘Anatomy of the Bra’ and become a lingerie expert! Ever wanted to know how a bra is designed or which shape is which? Then you’ll love our latest giveaway! Win a copy of Laurie van Jonsson’s new book Anatomy of the Bra and find out everything you ever wanted to know about bras and how they are made. To celebrate the upcoming paperback publication of Laurie van Jonsson’s Anatomy of the Bra, we’ve teamed up with the lingerie designer-turned-author to offer one lingerie enthusiast the chance to win a copy of the new book as well as her first title, How to Become a Lingerie Designer, which between them contain a wealth of information about bra design and the world of underwear. Anatomy of the Bra is all about demystifying this complex and essential female garment by taking it to pieces and reconstructing it to explain the whys and wherefores of how a bra works. It also contains interviews with established designers who share the most challenging aspects of the design process with Laurie. How to Become a Lingerie Designer was published last year and is a must-read for anyone who’s ever thought of making their own underwear. In it Laurie explains everything from patterns to costings and sizing with examples of product specifications and design tips, and there’s more insight from designers into this fascinating industry. Anatomy of the Bra is out in paperback in the next few weeks, but to get your hands on an advance copy – plus Laurie’s first book How to become a lingerie designer – just fill in our entry form. Want more competitions? Then make sure you enter our Tutti Rouge giveaway. We’ve got five sets of the brand’s frilly and flirty underwear up for grabs so don’t miss out! Be the first to hear about new competitions by signing up to our fortnightly newsletter. 1. The promoter of this competition is Fashion Bust (‘The Promoter’). The competition is only open to residents of the UK and Eire aged 18 or over who are not employed by or connected to the Promoter. 2. The competition will run until 11am on Sunday 22 September 2013. The prize is one copy of Anatomy of the Bra and How to Become a Lingerie Designer written and supplied by Laurie van Jonsson. 4. The winner will be chosen at random after the closing date and will be contacted by the Promoter. 5. Please note that no cash alternative will be offered. The prize is non-negotiable and the Promoter’s decision is final. 6. The prize will be provided to the winner within one month of the closing date of the competition. 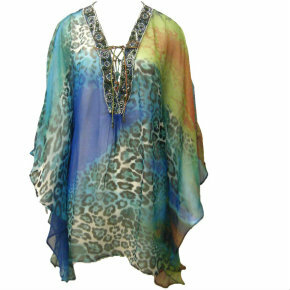 Win a designer Rhona Sutton kaftan worth £215! Sorry about that. We had a little tech glitch – it should all be fine now if you want to try again.